Forecasting is the window in the system where you can set a sales forecast by location by period and can enter daily values. 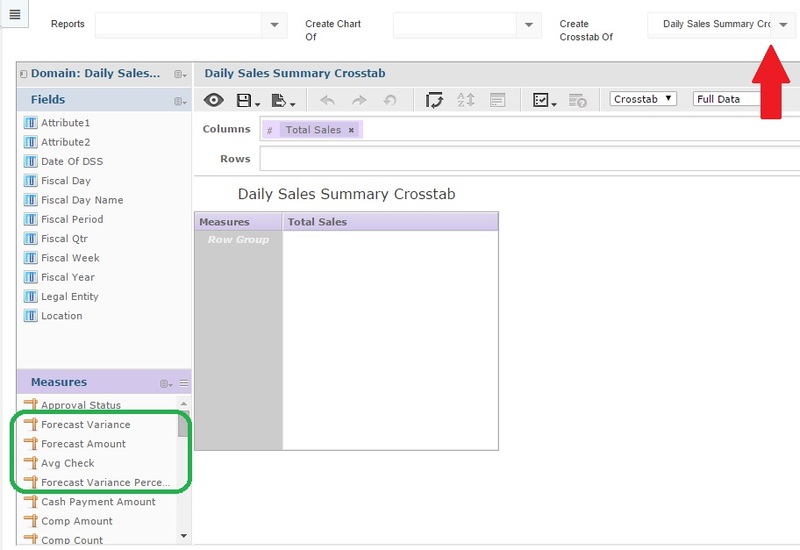 This forecast can be referenced in the Business Analytics module in the Daily Sales Summary data set to compare to actual values (steps to create this view are listed later in the training). Since forecasting is commonly looked at weekly, this window is designed to work for companies that have their Operational Year setup as 13-4 week periods or 4/4/5 periods so that it can be based on weeks. Calendar periods don't work well in this screen because calendar months don't line up neatly with the weeks you're forecasting. Forecasting is found in the Reports section of the Operations Module. When selected, the Forecasting window will load. To get started, select the desired Location, Period, and Value (sales is the only option value to forecast currently) and then click the "Get Period" button. If you have a saved forecast already for this period, this will load that forecast. If you don't have a saved forecast then this will load the period with $0 values for each day. Smart Forecast - this is the most complicated value to describe but also probably the best value to use to start a forecast. This also takes the longest to process so after pressing Go you may need to wait a minute for the Smart Forecast to populate the values. The system starts by getting the daily trend between this year and last year by getting the average sales by day of the week for the prior 8 weeks and then comparing that to the average sales by day of the week for those same 8 weeks last year. So for example if in the prior 8 weeks Saturday averaged $11,000 sales and Saturday averaged $10,000 in those same 8 weeks last year then your trend is 10% increase in Saturday sales this year. So then the system gets the actual values from last year for this same period that you are forecasting and applies that trend by day of the week. So if you're forecasting period 10 and if the actual value on the first Saturday in period 10 last year was $9,500 then the system will add 10% to that and forecast $10,450 for that same day this year. It will proceed to do that smart forecasting for every day of the period. To help give context to the forecast numbers, some users like to see how they compare to last year. To view this you can check the Show Prior Year check box at the top of the screen. This will display 2 additional values in every cell for prior year actual value and the variance between the prior year actual and this forecast value. While this information is often helpful, it can also make the screen busier to look at so the user can use this check box to choose whether to see it or not. Copy To Row Down button - if you've set values in the first row of the forecast and want those same values in the rest of the forecast by day of the week then press the "Copy Top Row Down" button in the upper right hand side of the window and the values for each day of the week will be copied to the other rows below. Adjusting by a certain % - If you want to increase the values in the forecast by a certain percent (for example if you started with prior year actual and want to increase by 3%) then you can set the percentages you want to increase by in the % fields just above each day name at the top of the grid and then press Apply % Adjustment (red arrow in image below). This will only update the rows you've selected by checking the box on the far right of that row (circled in green in image below). 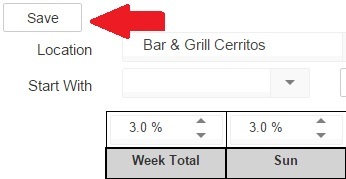 To help set the percentages for each day, if you want to set them with the same value, you can put that % in the field above the Week Total column (circled in red in image below) and tab off and it will put the same percent in each % field. Spread button on each row - If you want to set the week total and spread that evenly across each day of that week then put the value in the week total field (circled in red in image below) and then press the Spread button (red arrow in image below). A printable forecast is available from the Forecast screen by clicking the Print button at the top to the right of the Save button. This report will be formatted similar to the forecast screen.